The Nash Papyrus (second century B.C.E.) contains a portion of a pre-Masoretic Text, specifically the Ten Commandments and the Shema Yisrael prayer. The Masoretic Text (MT) is the Hebrew text of the Jewish Bible (Tanakh). It defines not just the books of the Jewish canon, but also the precise letter-text of the biblical books in Judaism, as well as their vocalization and accentuation for both public reading and private study. The MT is also widely used as the basis for translations of the Old Testament in Protestant Bibles, and in recent decades also for Catholic Bibles. The MT was primarily copied, edited, and distributed by a group of Jews known as the Masoretes between the seventh and tenth centuries C.E. Though the consonants differ little from the text generally accepted in the early second century, it has numerous differences of both little and great significance when compared to (extant fourth century) versions of the Septuagint, a Greek translation (around 300 B.C.E.) of the Hebrew Scriptures that was in popular use in Palestine during the common era and often quoted in the second part of the Christian Bible (known as the New Testament). The Hebrew word mesorah (מסורה, alt. מסורת) refers to the transmission of a tradition. In a very broad sense it can refer to the entire chain of Jewish tradition (as in Oral law), but in reference to the masoretic text the word mesorah has a very specific meaning: The diacritic markings of the text of the Hebrew Bible and concise marginal notes in manuscripts (and later printings) of the Hebrew Bible which note textual details, usually about the precise spelling of words. 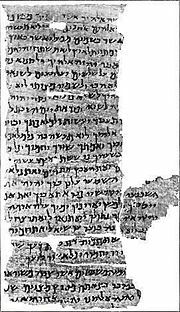 The oldest manuscripts containing substantial parts of the Masoretic Text known to still exist date from approximately the ninth century C.E., and the Aleppo Codex (the first ever complete copy of the Masoretic Text in one manuscript) dates from the tenth century. The Hebrew word masorah ("tradition") occurs in many forms. The term is taken from Ezekiel 20:37 and means originally "fetter." The fixation of the text was considered to be in the nature of a fetter upon its exposition. When, in the course of time, the Masorah had become a traditional discipline, the term became connected with the verb ("to hand down"), and was given the meaning of "tradition." The language of the Masoretic notes is partly Hebrew and partly Aramaic. The Masoretic annotations are found in various forms: (a) In separate works, for example, the Oklah we-Oklah; (b) in the form of notes written in the margins and at the end of codices. In rare cases, the notes are written between the lines. The first word of each Biblical book is also as a rule surrounded by notes. The latter are called the Initial Masorah; the notes on the side margins or between the columns are called the Small or Inner Masorah; and those on the lower and upper margins, the Large or Outer Masorah. The name "Large Masorah" is applied sometimes to the lexically arranged notes at the end of the printed Bible, usually called the Final Masorah, or the Masoretic Concordance. The Small Masorah consists of brief notes with reference to marginal readings, to statistics showing the number of times a particular form is found in Scripture, to full and defective spelling, and to abnormally written letters. The Large Masorah is more copious in its notes. The Final Masorah comprises all the longer rubrics for which space could not be found in the margin of the text, and is arranged alphabetically in the form of a concordance. The quantity of notes the marginal Masorah contains is conditioned by the amount of vacant space on each page. In the manuscripts, it varies also with the rate at which the copyist was paid and the fanciful shape he gave to his gloss. The Talmud (and also Karaite mss.) states that a standard copy of the Hebrew Bible was kept in the court of the Temple in Jerusalem for the benefit of copyists; there were paid correctors of Biblical books among the officers of the Temple (Talmud, tractate Ketubot 106a). This copy is mentioned in the Aristeas Letter (§ 30; comp. Blau, Studien zum Althebr. Buchwesen, p. 100); in the statements of Philo (preamble to his "Analysis of the Political Constitution of the Jews") and in Josephus (Contra Ap. i. 8). Another Talmudic story, perhaps referring to an earlier time, relates that three Torah scrolls were found in the Temple court but were at variance with each other. The differences were then resolved by majority decision among the three (p. Taanit 68a, Tractate Soferim 6:4 etc). Hence, the Masoretes contributed the Numerical Masorah. These notes are traditionally categorized into two main groups: The marginal Masorah and the final Masorah. The category of marginal Masorah is further divided into the Masorah parva (small Masorah) in the outer side margins and the Masorah magna (large Masorah), traditionally located at the top and bottom margins of the text. The Masorah magna, in measure, is an expanded Masorah parva. It is not printed in Biblia Hebraica Stuttgartensia (BHS). The final Masorah is located at the end of biblical books or after certain sections of the text, such as at the end of the Torah. It contains information and statistics regarding the number of words in a book or section, and so on. Thus, Leviticus 8:23 is the middle verse in the Pentateuch; all the names of Divinity mentioned in connection with Abraham are holy except (Genesis 18:3); ten passages in the Pentateuch are dotted; three times the Pentateuch has the spelling לא where the reading is לו. The collation of manuscripts and the noting of their differences furnished material for the Text-Critical Masorah. The close relation which existed in earlier times (from the Soferim to the Amoraim inclusive) between the teacher of tradition and the Masorete, both frequently being united in one person, accounts for the Exegetical Masorah. Finally, the invention and introduction of a graphic system of vocalization and accentuation gave rise to the Grammatical Masorah. The most important of the Masoretic notes are those that detail the Kethiv-Qere that are located in the Masorah parva in the outside margins of BHS. Given that the Masoretes would not alter the sacred consonantal text, the Kethiv-Qere notes were a way of "correcting" or commenting on the text for any number of reasons (grammatical, theological, aesthetic, and so on) deemed important by the copyist. The earliest labors of the Masoretes included standardizing division of the text into books, sections, paragraphs, verses, and clauses (probably in the chronological order here enumerated); the fixing of the orthography, pronunciation, and cantillation; the introduction or final adoption of the square characters with the five final letters (comp. Numbers and Numerals); some textual changes to guard against blasphemy and the like (though these changes may pre-date the Masoretes—see Tikkune Soferim); the enumeration of letters, words, verses, and so on, and the substitution of some words for others in public reading. Since no additions were allowed to be made to the official text of the Bible, the early Masoretes adopted other expedients: For example, they marked the various divisions by spacing, and gave indications of halakic and haggadic teachings by full or defective spelling, abnormal forms of letters, dots, and other signs. Marginal notes were permitted only in private copies, and the first mention of such notes is found in the case of R. Meïr (c. 100-150 C.E.). Early rabbinic sources, from around 200 C.E., mention several passages of Scripture in which the conclusion is inevitable that the ancient reading must have differed from that of the present text. The explanation of this phenomenon is given in the expression ("Scripture has used euphemistic language," that is, to avoid anthropomorphism and anthropopathy). Rabbi Simon ben Pazzi (third century) calls these readings "emendations of the Scribes" (tikkune Soferim; Midrash Genesis Rabbah xlix. 7), assuming that the Scribes actually made the changes. This view was adopted by the later Midrash and by the majority of Masoretes. In Masoretic works these changes are ascribed to Ezra; to Ezra and Nehemiah; to Ezra and the Soferim; or to Ezra, Nehemiah, Zechariah, Haggai, and Baruch. All these ascriptions mean one and the same thing: that the changes were assumed to have been made by the Men of the Great Synagogue. The term tikkun Soferim has been understood by different scholars in various ways. Some regard it as a correction of Biblical language authorized by the Soferim for homiletical purposes. Others take it to mean a mental change made by the original writers or redactors of Scripture; that is, the latter shrank from putting in writing a thought which some of the readers might expect them to express. Removal of unseemly expressions used in reference to God; for example, the substitution of "to bless" for "to curse" in certain passages. Safeguarding of the Tetragrammaton; for example, substitution of "Elohim" for "YHVH" in some passages. Removal of application of the names of false gods to YHVH; for example, the change of the name "Ishbaal" to "Ishbosheth." Among the earliest technical terms used in connection with activities of the Scribes are the "mikra Soferim" and "ittur Soferim." In the geonic schools, the first term was taken to signify certain vowel-changes which were made in words in pause or after the article; the second, the cancellation in a few passages of the "vav" conjunctive, where it had by some been wrongly read. The objection to such an explanation is that the first changes would fall under the general head of fixation of pronunciation, and the second under the head of "Qere" and "Ketiv." Various explanations have, therefore, been offered by ancient as well as modern scholars without, however, succeeding in furnishing a completely satisfactory solution. There are four words having one of their letters suspended above the line. One of them, (Judges 18:30), is due to an alteration of the original out of reverence for Moses; rather than say that Moses' grandson became an idolatrous priest, a suspended nun was inserted to turn Mosheh into Menasheh (Manasseh). The origin of the other three (Psalms 80:14; Job 38:13, 15) is doubtful. According to some, they are due to mistaken majuscular letters; according to others, they are later insertions of originally omitted weak consonants. In fifteen passages in the Bible, some words are stigmatized; that is, dots appear above the letters. The significance of the dots is disputed. Some hold them to be marks of erasure; others believe them to indicate that in some collated manuscripts the stigmatized words were missing, hence that the reading is doubtful; still others contend that they are merely a mnemonic device to indicate homiletical explanations which the ancients had connected with those words; finally, some maintain that the dots were designed to guard against the omission by copyists of text-elements which, at first glance or after comparison with parallel passages, seemed to be superfluous. Instead of dots some manuscripts exhibit strokes, vertical or else horizontal. The first two explanations are unacceptable for the reason that such faulty readings would belong to Qere and Ketiv, which, in case of doubt, the majority of manuscripts would decide. The last two theories have equal probability. In nine passages of the Bible are found signs usually called "inverted nuns," because they resemble the Hebrew letter nun ( נ ) written upside down. The exact shape varies between different manuscripts and printed editions. In no manuscript, however, is an upside-down nun used. In many manuscripts, a reversed nun is found—referred to as a "nun hafucha" by the masoretes. In some earlier printed editions, they are shown as the standard nun upside down or inverted, because the printer did not want to bother to design a character to be used only nine times. The recent scholarly editions of the masoretic text show the reversed nun as described by the masoretes. In some manuscripts, however, other symbols are occasionally found instead. These are sometimes referred to in rabbinical literature as "simaniyot," (markers). The primary set of inverted nuns is found surrounding the text of Numbers 10:35-36. The Mishna notes that this text is 85 letters long and dotted. This demarcation of this text leads to the later use of the inverted nun markings. Saul Liberman, demonstrated that similar markings can be found in ancient Greek texts where they are also used to denote "short texts." During the Medieval period, the inverted nuns were actually inserted into the text of the early Rabbinic Bibles published by Bromberg in the early sixteenth century. The talmud records that the markings surrounding Numbers 10:35-36 were thought to denote that this 85 letter text was not in its proper place. One opinion goes so far as to say that it would appear in another location in a later edition of the Torah. Bar Kappara is known to have considered the Torah as comprised of 7 volumes. Genesis, Exodus and Leviticus and Deuteronomy as we know them but Numbers was really 3 separate volumes Num 1:1 to Num 10:35 followed by Number 10:35-36 and the third text from there to the end of Numbers. The 85 letter text is also said to be denoted because it is the model for the least number of letters which constitute a "text" which one would be required to save from fire due to its holiness. The history of the Masorah may be divided into three periods: (1) creative period, from its beginning to the introduction of vowel-signs; (2) reproductive period, from the introduction of vowel-signs to the printing of the Masorah (1525 C.E. ); (3) critical period, from 1525 to the present time. The materials for the history of the first period are scattered remarks in Talmudic and Midrashic literature, in the post-Talmudical treatises Masseket Sefer Torah and Masseket Soferim, and in a Masoretic chain of tradition found in Ben Asher's "Diḳduḳe ha-Ṭe'amim," § 69 and elsewhere. In the course of time, differences in spelling and pronunciation had developed not only between the schools of the Land of Israel and of Babylonia—differences already noted in the third century—but in the various seats of learning in each country. In Babylonia the school of Sura differed from that of Nehardea; similar differences existed in the schools of the Land of Israel, where the chief seat of learning in later times was the city of T'veryah/Tiberias. These differences must have become accentuated with the introduction of graphic signs for pronunciation and cantillation; and every locality, following the tradition of its school, had a standard codex embodying its readings. In this period living tradition ceased, and the Masoretes in preparing their codices usually followed the one school or the other, examining, however, standard codices of other schools and noting their differences. In the first half of the tenth century, Aaron ben Moses ben Asher and Moshe ben Naphtali (often just called ben Asher and ben Naphtali) were the leading Masoretes in Tiberias. Their names have come to symbolize the variations among Masoretes, but the differences between ben Asher and ben Naphtali should not be exaggerated. There are hardly any differences between them regarding the consonants, though they differ more on vowelling and accents. Also, there were other authorities such as Rabbi Pinchas and Moshe Moheh, and ben Asher and ben Naphtali often agree against these others. Further, it is possible that all variations found among manuscripts eventually came to be regarded as disagreements between these figureheads. Ben Asher wrote a standard codex (the Aleppo Codex) embodying his opinions. Probably Ben Naphtali did too, but it has not survived. It has been suggested that there never was an actual "Ben Naphtali;" rather, the name was chosen (based on the Bible, where Asher and Naphtali are the younger sons of Zilpah and Bilhah) to designate any tradition different from Ben Asher's. This is unlikely, as there exist lists of places where ben Asher and Ben Naphtali agree against other authorities. Ben Asher was the last of a distinguished family of Masoretes extending back to the latter half of the eighth century. Despite the rivalry of Ben Naphtali and the opposition of Saadia Gaon, the most eminent representative of the Babylonian school of criticism, Ben Asher's codex became recognized as the standard text of the Bible. The two rival authorities, Ben Asher and Ben Naphtali, practically brought the Masorah to a close. Very few additions were made by the later Masoretes, styled in the thirteenth and fourteenth centuries Naḳdanim, who revised the works of the copyists, added the vowels and accents (generally in fainter ink and with a finer pen) and frequently the Masorah. Many believe that the Ben Asher family were Karaites. Considerable influence on the development and spread of Masoretic literature was exercised during the eleventh, twelfth, and thirteenth centuries by the Franco-German school of Tosafists. R. Gershom, his brother Machir, Joseph ben Samuel Bonfil] (Tob 'Elem) of Limoges, R. Tam (Jacob ben Meïr), Menahem ben Perez of Joigny, Perez ben Elijah of Corbeil, Judah of Paris, Meïr Spira, and R. Meïr of Rothenburg made Masoretic compilations, or additions to the subject, which are all more or less frequently referred to in the marginal glosses of Biblical codices and in the works of Hebrew grammarians. Jacob ben Hayyim ibn Adonijah, having collated a vast number of manuscripts, systematized his material and arranged the Masorah in the second Daniel Bomberg edition of the Bible (Venice, 1524-25). Besides introducing the Masorah into the margin, he compiled at the close of his Bible a concordance of the Masoretic glosses for which he could not find room in a marginal form, and added an elaborate introduction – the first treatise on the Masorah ever produced. In spite of its numerous errors, this work has been considered by some as the "textus receptus" of the Masorah (Würthwein 1995, 39), and was used for the English translation of the Old Testament for the King James Version of the Bible. Next to Ibn Adonijah the critical study of the Masorah has been most advanced by Elijah Levita, who published his famous "Massoret ha-Massoret" in 1538. The "Tiberias" of the elder Johannes Buxtorf (1620) made Levita's researches more accessible to a Christian audience. The eighth prolegomenon to Walton's Polyglot Bible is largely a réchauffé of the "Tiberias." Levita compiled likewise a vast Masoretic concordance, "Sefer ha-Zikronot," which still lies in the National Library at Paris unpublished. The study is indebted also to R. Meïr b. Todros ha-Levi (RaMaH), who, as early as the thirteenth century, wrote his "Sefer Massoret Seyag la-Torah" (correct ed. Florence, 1750); to Menahem di Lonzano, who composed a treatise on the Masorah of the Pentateuch entitled "Or Torah"; and in particular to Jedidiah Solomon of Norzi, whose "Minḥat Shai" contains valuable Masoretic notes based on a careful study of manuscripts. The Dead Sea Scrolls have shed new light on the history of the Masoretic Text. Many texts found there, especially those from Masada, are quite similar to the Masoretic Text, suggesting that an ancestor of the Masoretic Text was indeed extant as early as the second century B.C.E. However, other texts, including many of those from Qumran, differ substantially, indicating that the Masoretic Text was but one of a diverse set of Biblical writings. There have been very many published editions of the Masoretic text; this is a list of some of the most important. The second Rabbinic Bible, which served as the base for all future editions. Nearly all eighteenth and nineteenth century Bibles were almost exact reprints of this edition. As well as the van der Hooght text, this included the Samaritan Pentateuch and a huge collection of variants from manuscripts and early printed editions; while this collection has many errors, it is still of some value. The collection of variants was corrected and extended by Johann Bernard de Rossi (1784–8), but his publications gave only the variants without a complete text. The 1852 edition was yet another copy of van der Hooght. The 1866 edition, however, was carefully checked against old manuscripts. It is probably the most widely reproduced text of the Hebrew Bible in history, with many dozens of authorised reprints and many more pirated and unacknowledged ones. Snaith based it on Sephardi manuscripts such as British Museum Or.2626-28, and said that he had not relied on Letteris. However, it has been shown that he must have prepared his copy by amending a copy of Letteris, because while there are many differences, it has many of the same typographical errors as Letteris. Snaith's printer even went so far as to break printed vowels to match the broken characters in Letteris. Snaith combined the accent system of Letteris with the system found in Sephardi manuscripts, thereby creating accentuation patterns found nowhere else in any manuscript or printed edition. The text was derived by comparing a number of printed Bibles, and following the majority when there were discrepancies. Biblia Hebraica Quinta, revision of Biblia Hebraica Stuttgartensia; only the first volume (Five Megilloth) has been published. ↑ Jerusalem Post, Rare scroll fragment to be unveiled. Retrieved July 23, 2008. Lane Fox, Robin. The Unauthorized Version. Alfred A. Knopf, 1991. ISBN 0-394-57398-6. Tov, Emanuel. Textual Criticism of the Hebrew Bible. Fortress Press, 1992. ISBN 0-8006-3429-2. Würthwein, Ernst. The Text of the Old Testament. Fortress Press, 1995. ISBN 0-8028-0788-7. This page was last modified on 31 August 2018, at 14:45.